Good. All orders guaranteed and ship within 24 hours. Your purchase supports More Than Words, a nonprofit job training program for youth, empowering youth to take charge of their lives by taking charge of a business. Fair. This is a used book. It may contain highlighting/underlining and/or the book may show heavier signs of wear. It may also be ex-library or without dustjacket. Good. A copy that has been read, but remains in clean condition. All pages are solid. the cover is intact, but may show scuffs or light creases, as well as a possible rolled corner. The spine may show signs of wear. Pages may include limited notes and highlighting, The former owner may have written their name inside the front or back cover. Unless otherwise explicitly stated here, there are codes or disks included with this purchase. Fast Shipping Monday through Friday! -Safe and Secure with tracking! Fair. All pages and the cover are intact, but may show heavy wear. Some pages are creased. Some peeling and/or curling is on the cover. Some creasing is on the cover. The spine is cocked. ~ Goodwill Industries of Greater Grand Rapids, Inc. is a non-profit organization dedicated to changing lives and communities through the power of work. There are not enough exclamation points to express how great this book is!!!!! The tongue-in-check introductions from the anniversary editions are just as much fun to read as the book itself!!! Absolutely great read!!!!! This was definitely a unique kind of story with hilarious satiric wit (if you like that kind of humor). Goldman peppers his narrative with mix-ups of Biblical stories and theological non sequitors, notes on why he "abridged this part of the original Morgenstern novel", and complaints about how his editor wouldn't let him change this-and-such. Reading through these last got tedious after the first two page-long notes, though his italicized remarks on what his reactions were when "his father read the book to him" when he was little were amusing. 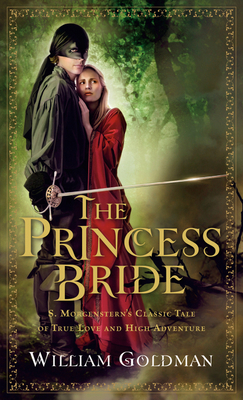 Though for the most part the movie version of "The Princess Bride" follows the book, there are significant differences - instead of having his Pit of Despair, Prince Humperdinck has a Zoo of Death; Princess Buttercup's feelings toward Westley actually develop through the story; and the back stories of Inigo, the revenge-obsessed Spaniard, and Fezzik, the slow-witted giant, are told in detail. The book raises more moral problems than does the movie version, and this was specifically what brought the rating down, as well as the occasional swearing and its irreverence toward God. It is not a book meant to be original: it is a book making fun of a completely cliche storyline...and it does a good job at that.